In studying legends and folklore from around the world, one also learns about existing cultural traditions and taboos. As an example, in parts of Asia there is a custom called ohagura involving dyeing one’s teeth black. This practice was mainly performed by women indicating their martial status, wealthy, and sexual maturity. The custom has existed in Japan for hundreds of years that may have given birth to the legend of Ohaguro-Bettari. In Japan, there are many folklore about creatures called yokai, which is a board term given to the ghosts, spirits and other supernatural monsters within the country. These spirits are the end results when humans, animal or even household items are involved in tragic events such as war, death, murder, suicide and any number of other violent acts. 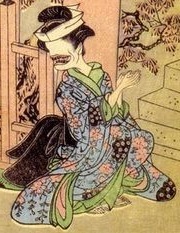 The Ohaguro-Bettari is a female yokai believe to be the ghost of an unwed bride or an unattractive woman that died or committed suicide before finding a husband. In researching this yokai, her only intentions are to make her presence known to humans and scare them off. The Ohaguro-Bettari is known to be among the spirits that enjoy tormenting people for entertainment. There is no myth or legend of any death or injury to be attributed to this ghost when encountered, but sightings are always rare. If there is a moral about the Ohaguro-Bettari to be learned, it would be careful meeting beautiful women at night that appear out of nowhere. This entry was posted in Ghosts and Hauntings and tagged Ghosts, Monster on November 21, 2015 by Gatekeeper. Excellent blog! Do you have any tipos and hints for aspiring writers? Thanks Linwood for checking out Abnormal Realm. I would recommend going with a free service first like WordPress or Google’s blogger before going for the paid option. Better to test out the water before investing any money. Hope that helps.